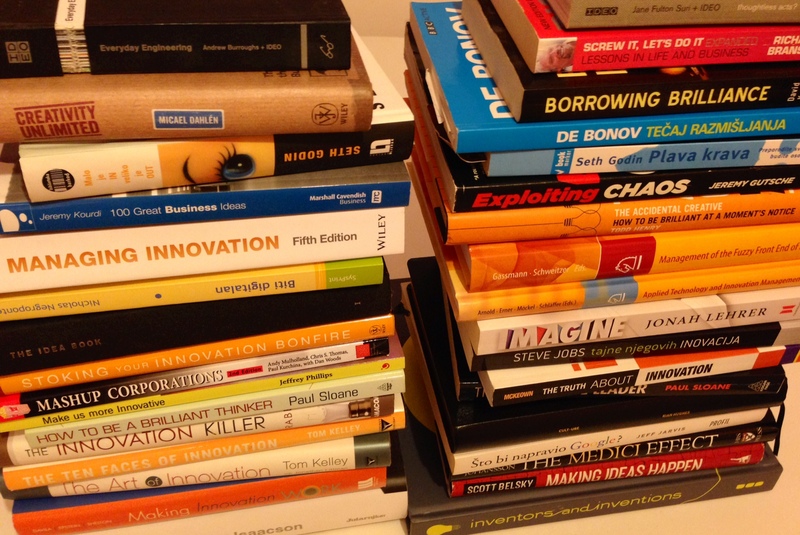 There are hundreds of books published each year with topic: Innovation. Many of them are strictly scientific, others are business or inspirational, but how to know which are worth to read? – The Art of Innovation (Tom Kelley) – This is the first innovation book I read. Tom Kelley is giving here the description of IDEO’s creative process & their innovation ecosystem. – Borrowing Brilliance (David Kord Murray) – walkthrough the innovators mind by building on the ideas of others. – The Ten Faces of Innovation (Tom Kelley) – Another Tom Kelley’s with focus on types of innovation & types of innovators. – Exploiting Chaos (Jeremy Gutsche) – TrendHunter founder gives great overview of innovation trends in past and future. – The Medici Effect (Frans Johansson) – Right ecosystem should produce innovation, very useful book. – The Idea Book (Fredrik Haren) – great creativity starter, I’m often coming back to this book. – Making Ideas Happen (Scott Belsky) – 99u’s Scott Belsky with interesting book which can be described strictly as the header suggests “Making Ideas Happen”. – Anticonventional Thinking (Jeffrey Baumgartner) – Introduction to Anticonventional Thinking – a new creativity method as an alternative to the well-known brainstorming. ACT should replace brainstorming and give every innovation manager a better chance for realisation of ideas. – The Innovative Leader (Paul Sloane) – I love how Paul Sloane write (I’m trying to write in the same way), this book is great first input for every innovation manager. – Relentless Innovation (Jeffrey Phillips) – Book written by my favorite blogger is giving many (original) informations for innovation managers and business leaders. – Innovation Paradox (Tony Davila, Marc J. Epstein) – Really great book from authors of Making Innovation Work. It gives an overview on Innovation Paradox – problem of big corporations which must learn to think and do like startups. – The Innovation Book (Max McKeown) – Overview of innovation management, great book to start with this topic. – Steve Jobs (Walter Isaacson) – Apple’s and Jobs’ innovation system through years. – Screw It, Let’s Do It: Lessons in Life and Business (Richard Branson) – Virgin’s founder gives here many lessons about creativity and innovation. – Making Innovation Work (Davila, Epstein, Shelton) – The most comprehensive book about the topic with full overview of innovation methods & process. – Managing Innovation (Tidd & Bessant) – Simply: encyclopedia of innovation – must have for everyone interested in this topic. – Lean Startup (Eric Ries) – Everybody is talking about it. – Rework (Fried, Heinemeier Hansson) – Transform the way you work everyday. Book for business-owners, start-ups and entrepreneurs who wants quick and effective advices. – Better and Faster (Jeremy Gutsche) – This is continuing on the shoulders of its predecessor “Exploiting Chaos”. The book is a quick guide how to be successful in today’s world marking the benefits of newest technology and the need of trend spotting. It has three parts: Awaken, Hunt and Capture. After awaking the Hunter, author is leading us through the hunt, and to the end – Capture. Of course this is truly an idea process for every individual, or better to say every entrepreneur-to-be. I also like the book “Real Innovation”. I dont’ have sufficient time to read books about Innovation Management. Although I did read a lot if them in the past. This seems to be a great reading list. Enjoy.